In which of the following solvents will CO2 dissolve best? What happens to the water in a lake when it warms up in the summer? What happens when NaCl is added to water? An impure solution is going to have a lower melting point and higher boiling point. A certain liquid has a vapor pressure of 600 torr at room temperature. What will happen to the liquid if the atmospheric pressure will drop to 550 torr at the same temperature? If the vapor pressure is greater than atmospheric pressure then the liquid will start to boil faster. Which of the following compounds will have the highest boiling point? CH3OH - hydrogen bond is present so there is a stronger bond between molecules, making the boiling point really high. Which of the following processes will be exothermic? Energy is being removed so gas transforms into a liquid state. What phase is stable at point G? Which of the following graphs shows correctly the evolution of temperature (T) vs heat added (kJ), when 100 mL of water is heated starting from 50 °C to 150 ºC, at atmospheric pressure? 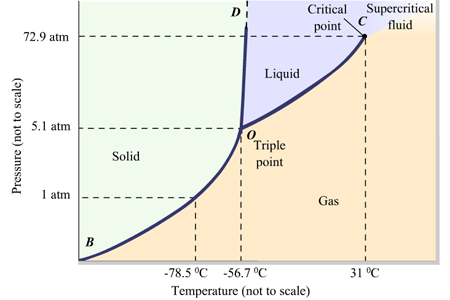 An impure solution has a low melting point. Think about putting salt on ice/ snow. Pure ice freezes at 32 F, but with salt the ice freeze at 20 F. So if the temp outside is 32 F and there is salt on the ice the ice will only freeze if the temp reaches 20F, otherwise the ice will melt at 32F. Which of the following liquids will have the highest vapor pressure at room temperature?